Z.H.P. Unlosing Ranger VS Darkdeath Evilman, known as Zettai Hero Kaizou Keikaku (絶対ヒーロー改造計画 Zettai Hīrō Kaizō Keikaku, lit. 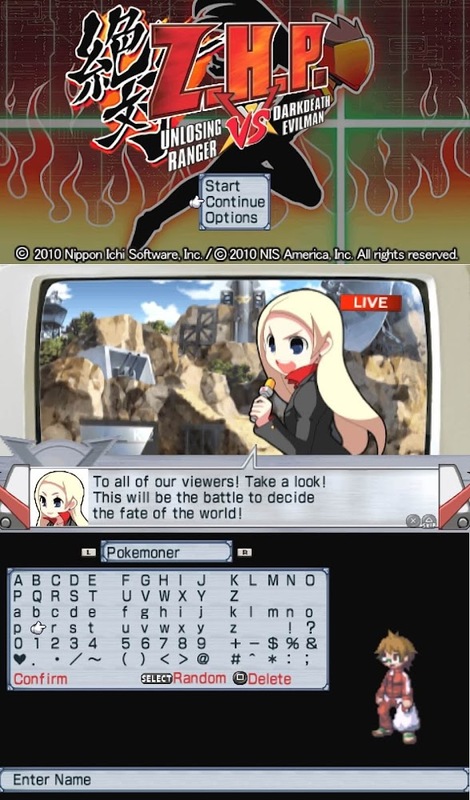 "Absolute Hero Modding Project") in Japan, is a tactical role-playing video game for the PlayStation Portable. The story follows the exploits of the silent Main Character, who becomes a hero called the Absolute Victory Unlosing Ranger after the previous Absolute Victory Unlosing Ranger is killed. The new Absolute Victory Unlosing Ranger must train to become strong enough to defeat the evil demon general Darkdeath Evilman and rescue the world’s prophesized savior, a super-powered baby called "Super Baby". 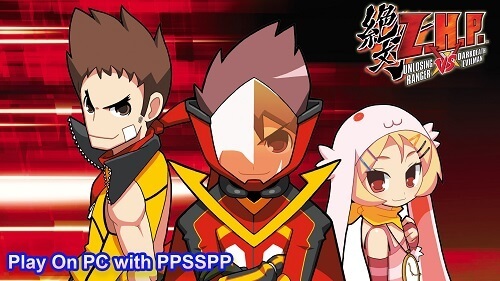 Unlike most Nippon Ichi games, Z.H.P. Unlosing Ranger VS Darkdeath Evilman is centered around a single playable character exploring randomly generated, multi-level dungeons similar to those of the Mystery Dungeon games. However, some gameplay mechanics common among Nippon Ichi games are featured in Z.H.P., such as the ability to pick up and throw enemies. Most dungeons, as well as the boss battles at the ends of some dungeons, feature their own unique mechanics and gimmicks, such as cannons that launch the player to a random location on the current floor. Similar to roguelike games, the player is reset to level one upon entering a dungeon. However, upon completing a dungeon or being defeated, the player's current level is added to their Total Level count, which affects their base attributes. In the year 20XX, a baby who is prophesied to save the Earth is born. The people of Earth name it "Super Baby" and pamper it, but its sudden popularity results in it being kidnapped by the monstrous Demon General Darkdeath Evilman. Darkdeath Evilman is then challenged to a fight by the Absolute Victory Unlosing Ranger, a hero reported to be invincible, to decide the fate of Super Baby and the Earth. The game begins with the actual Absolute Victory Unlosing Ranger, Pirohiko Ichimonji, running late for his climactic battle due to oversleeping. As he rushes to confront Darkdeath Evilman, he is hit by a passing truck and killed. Before dying, Pirohiko hands his Morphing Belt to a random passerby, the silent Main Character, forcing him to inherit the title and duties of the Absolute Victory Unlosing Ranger. The new Ranger then arrives to fight Darkdeath Evilman as the people of the world watch on television, but he is promptly defeated. However, he is saved at the last minute by the World Hero Society and taken to the Hero Training Facility, a space station floating above an alternate version of Earth called Bizarro Earth. There he meets Pirohiko’s ghost, who has become his guardian spirit, and Etranger, a cynical training instructor. Etranger immediately forces the Main Character to undergo training until he is strong enough to defeat Darkdeath Evilman, sending him on missions to help the people on Bizarro Earth and thus resolve personal conflicts of the people of Earth. Over the course of the story, the Main Character helps people and therefore gains power, although he is still unable to defeat Darkdeath. He also realizes that Etranger is actually Super Baby, psychically projecting herself into Bizarro Earth to help the Main Character. Once he reaches the final dungeon, he discovers that Darkdeath Evilman is actually a mecha piloted by a boy genius who was doubtful that real heroes existed. He gains enough power to finally destroy the amok Darkdeath robot with the help of Reckless Cop Dangerama, and is able to throw it into space before it explodes, saving the world.